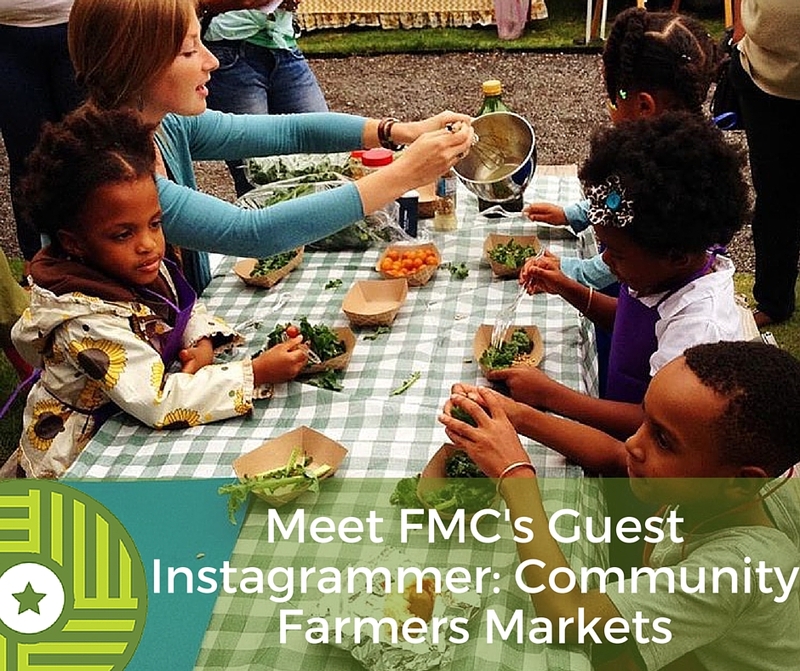 Switching gears this week, FMC’s Guest Instagram series travels south to Atlanta, Georgia, where Community Farmers Markets, a coalition of farmers markets, will show us how a large organization fuels the Peach State through community outreach, education, food access, and – of course – fresh southern fare! Alex Lampert, Marketing and Communications Director, tells us all about how CFM is making a phenomenal impact in the local food movement. Farmers Market Coalition: Tell us about the Community Farmers Market collaborative and the markets sheltered under its umbrella. Alex Lampert: Community Farmers Markets (CFM) was founded by leaders in the local food movement in Atlanta out of a demand for more efficiently-managed, community-based, sustainable farmers markets. These stakeholders include farmers and local leaders who work for a more vibrant local food system and who have special interest, talents, or resources to build a stronger local food movement. Our organization is comprised of 5 markets: East Atlanta Village Farmers Market, Grant Park Farmers Market, Decatur Farmers Market, Westside Provisions District Farmers Market and Fresh MARTA Market. Building upon the success of the East Atlanta Village Farmers Market (EAVFM), CFM replicated the EAVFM model and expanded to the Grant Park neighborhood in 2011. The Grant Park Farmers Market was an instantaneous success with 30 vendors and over 1,800 shoppers on opening day. By pooling resources and expertise, CFM has the capacity to go beyond the role of a traditional farmers market and expand the services offered by these markets, specifically around health education, professional development, and community building. In the 2011 season, the EAVFM developed an extensive educational outreach and community building model. CFM has since taken the Decatur Farmers Market under it’s umbrella and expanded into 2 weekly markets in Decatur. CFM opened the Westside Provisions District Farmers Market in 2015, which was well-received and will re-open in April. CFM is also partnering with the Atlanta Food Bank and Georgia Food Oasis to operate the Fresh MARTA Market, a weekly market set up in the West End MARTA (Atlanta’s public transit system) station as a food access initiative. CFM select farmers based on geographic proximity to Atlanta (all producers must be within roughly 200 miles of Atlanta) and standards of sustainability; our vegetable farmers meet CNG or Organic standards, though we do not require them to be certified. With orchard fruit, those standards are very difficult to meet in the southeast’s climate, so we host both conventional locally grown and organic, local vendors for peaches and apples. Other vendors include locally sourcing producers, locally-owned & operated restaurants & chefs, and local craft artisans. CFM has a full time staff of 4 people, and 3 more part-time positions for each market location. We have just over 100 vendors, and one of the most exciting aspects of our organization is that many of our farmers grow within or very close to Atlanta’s city limits. We are proud to host several urban farmers at our markets! CFM partners with Wholesome Wave Georgia to double the value of SNAP spent at markets. Through this initiative, over $87,000 was spent at our markets in 2014, so the program has a very good reach and significant impact on food access in Atlanta. Another unique aspect of CFM’s model is that we also work diligently to build community around our markets. We work directly with community-based organizations & small businesses in varieties of partnerships, and we have a weekly community tent at our markets to host their presence. Each of CFM’s markets are weekly, outdoor markets in a variety of spaces. The Grant Park Farmers Market is held in historic Grant Park, located very close to downtown Atlanta and is our largest market with the most vendors. This spring, CFM raised funds to renovate the East Atlanta Village Farmers Market lot. Previously an empty gravel lot, the market location was a frequent site of petty crime when the market was not in operation (often used as a parking lot). CFM raised funds to renovate the lot, which we have turned into a community park, now with grass and green space, an edible learning garden, and a soon-to-be-finished cooking education shed. The Decatur Wednesday market is held on the front lawn of the First Baptist Church of Decatur, and the Decatur Saturday market is only a block or so away from the main square. Both locations are walkable from downtown Decatur and host farmers from Decatur and it’s surrounding county, Dekalb County. The Westside Farmers Market is held on a street in the Westside Provisions District, a shopping center on the Westside of Atlanta. The Fresh MARTA Market takes place in the West End MARTA station, a high-traffic station, fitting for a good presence of commuters shopping on their way home from work, in a neighborhood that otherwise has difficult access to quality food. The produce at the market is sourced from both local growers and through the Atlanta Food Bank to offer a variety of products. The local growers at that market are a part of SWAG – South West Atlanta Growers, a cooperative of African-American growers in southwest Atlanta (closely located to the market itself and also within Atlanta city limits). Through this model, we aim to make farming locally more viable, and improve food access for the community. Only one of our markets has remained open through the winter, our Decatur farmers market. The rest are open typically from April – December. FMC: In what ways have CFM Markets grown to become community anchors for health and prosperity? All CFM markets accept and double the value of SNAP spent at markets. We also conduct outreach & educational programming outside of markets. Beyond having a presence at other community events and conducting cooking demos at them, we have developed ongoing culinary education programs focused on cooking resourcefully and seasonally. These take place at children’s organizations, city housing authority centers, and senior-focused organizations. CFM’s markets also host free, festive events at market, including lots of fun activities for Halloween at our markets, a Dia de los Meurtos celebration and Kale Fest, to name a few. FMC: How has CFM utilized social media to promote its markets, vendors, and programming? AL: Our strategies for social media have only really started this year, over the course of this season. As of now, we have at least one post a day on our market Facebook accounts (which auto-feed to our Twitter accounts), and a daily Instagram post on our organization’s account. Each at-market program gets a post the week leading up to market, and we also select one vendor a week to feature. Since we’ve implemented a strategy for Instagram, we’ve seen a dramatic increase in followers. For that, we use high quality photos that represent the diverse stakeholders & programming involved with our organization. Reposting from customers & other organizations has helped immensely in this effort. For our Facebook strategy, frankly, we’ve seen less of a result, but feel like it’s more important for community relations and web presence – treating it like a free platform for not only promoting what’s at the market and trying to stay on people’s minds, but also for recognizing our partnerships and vendors. FMC: There’s a lot going on with CFM! What should our followers look forward to seeing from your markets? AL: Everything! We’re looking forward to sharing some of the things that we feel make our markets (and Atlanta) unique. So, that means not just highlighting some of our awesome, sustainable, local and unique farmers at our markets and they’re special varieties of produce, but posts on our outreach education and chefs at market as well. We’d like for FMC’s audience to see how diverse and growing Atlanta’s local food scene and initiatives are, how great communities are here, and how many different kinds of opportunities exist in places you’d least expect. Want to learn more about Community Farmers Markets? Follow FMC on Instagram!